Join us for a post-conference social at the historic Scholz Garten in Austin, where we can talk all things Chicago, experientially speaking. Join us for drinks and snacks at this happy hour event. Drinks and snacks from 6pm to 8pm. Please join us for the next studio crawl installment! This time, we'll be visiting with Dyal & Partners and touring their facility. Dyal & Partners is a planning and design firm that creates brand identities, environments, environmental graphics, websites and related services for its clients. We will have snacks and refreshments onsite to enjoy during and after the tour. 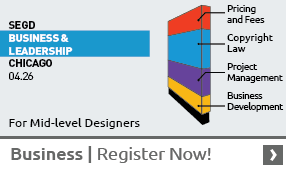 Please join us and help to promote SEGD Austin! The second event in our Studio Crawl series, where we are showcasing local EGD firms and giving students a look into the typical day for a local experiential graphic designer. For this crawl, will be getting an up-close-and-personal look at fd2s' new office. Curtis Roberts and Steve Stamper will guide the group. Join us immediately afterwards for a social, sponsored by S|N|A. 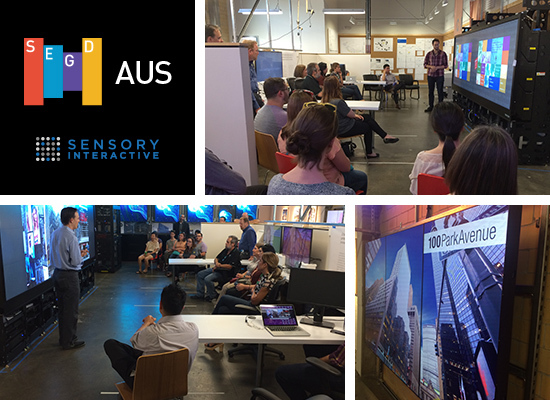 We had great attendance at the Sensory Interactive studio crawl in the first of several tours of local studio tours in the experiential design community. Thank you to all who attended and a special thanks to Greg Giordano and Sensory Interactive for being wonderful hosts. All attendees were invited to the post-event social, sponsored by S|N|A.